The Regional Planning Affiliation (RPA 8) is a four-county region including the counties of Clinton, Delaware, Dubuque and Jackson in Eastern Iowa. 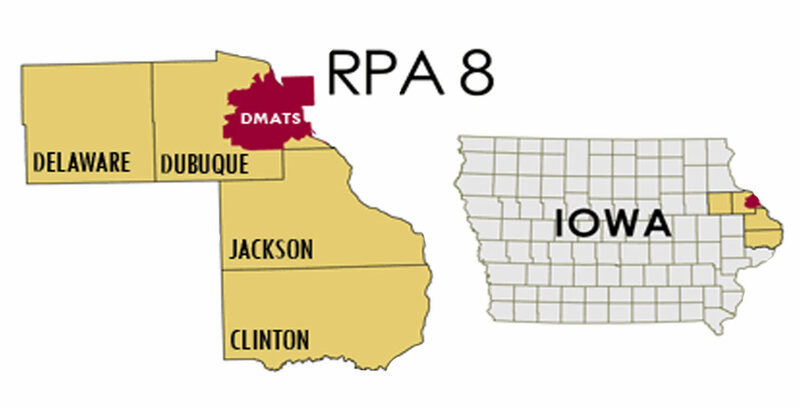 The size of the cities served by RPA 8 ranges from 24 in Durango to 77,018 in the Dubuque metro. The RPA organizes and oversees the planning and development of the multimodal transportation system using Federal funds under the guidance of the State of Iowa. The process was created by the State of Iowa to give local elected officials input into the transportation development process outside the Metropolitan Planning Organizations. The committee identifies transportation improvements and prepares plans for the development of all parts of the transportation system (roads, trails, transit, rail, river transportation and air) in the rural area. The RPA staff also coordinates the activities of local, regional, state and federal agencies to develop transportation improvements.